Helen Keller once mentioned that the world of the blind was not boring but a constant adventure. That is what I call a positive attitude. I am now taking care of my parents and find Keller's optimism even more amazing . . . and inspiring. My mother is 88 years old and is becoming progressively blind and deaf. She can hear most of what is said if one speaks slowly and loudly into her left ear. He eyesight is failing--and she was legally blind before now. She can see a little out of the corners of her eyes and works around the house mostly by touch and smell. She cares for my dad. My dad is a month away from 93 years of age. He has a pacemaker and is somewhat mobile--enough to move 20 or 30 feet to the kitchen, bathroom, or living room with a walker. He is extremely forgetful and confused. Recently, he just wants to lie in bed because of dizziness. I have to honestly say that they do not see their current reality as an adventure but more as a struggle, one they are bravely continuing but with an increasing doubt as to whether it is all worth it. I think right now, they continue on for each other's sake, so that no one will be alone. Black American sisters at the ages of 101 and 103, the book is a chronicle of American history from the eyes of two who lived those hundred years and experienced great change for their people and for their nation--for they were unabashedly patriotic. The book is filled with thoughtful and humorous quotations steeped in the wisdom of their years: "Life is short, and it's up to you to make it sweet." 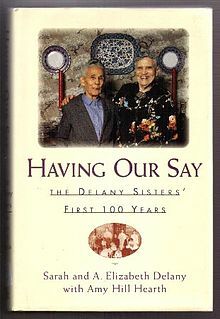 This book was written, though, when Sadie and Bessie Delancy were both alert and active, even in their years. They do talk about their mother, whom they cared for in her last years, and how they had to watch over her because of her wandering mind and feet. My parents have completed "death with dignity" agreements that are signed by them, their doctor, and by me. These agreements essentially say that if major heart or respiratory failure occur, to let them go rather than being brought back to live in even greater diminished capacity. They've had their adventure and are ready to move on to their final journey when the time arrives. Like the Sword of Damocles, modern medicine can give you life--even more than you would wish to have. Modern medicine can prolong life and also prolong suffering. And who can say how long a life is enough? Even the individual him or herself may not be able to answer that if the mind is too confused or feeble. I am not being needlessly depressed, though, nor do I wish to depress anyone reading this. Rather, I am inspired to provide my parents with a good environment. I am inspired to keep myself healthy and to not delude myself that modern medicine can extend our lives beyond our natural time. I am inspired to live my life and to love the world and its people, including myself. As a young man, my dad and mom would take us camping in the Sierra Nevadas, and my dad would say, "Always leave the campsite in better shape than when you arrived." I think there's great wisdom in that. Enjoy our time in this life. Make our thoughts and actions worthwhile. And don't think breath so precious that we forget that "inspiration" means taking in spirit and therefore overstay our time allotted us. We shouldn't end our lives saying to ourselves the words of Oliver Hardy: "Here's another nice mess you've gotten me into." There's enough serendipity in the world without our adding to the mess. I think your Dad has the right idea, if only more of us felt that way the earth and the world we live in right now would be in so much better shape and so would it's inhabitants. Watching the ones we love, whom we looked up to our whole lives as being strong and pretty much indestructible, grow older and infirm struggling from day to day is not pleasant or easy that is for sure. Tom my father was one of those whom medical science managed to prolong the life of, when he died at 82 no it was not enough time but in other respects with all his physical ailments and pain it was actually well past the time when he should have gone on. My mother is now 76, she is in better physical shape than I am at 50 and hopefully she stays that way for her sake as she has been my rock and my comfort for my entire life and as long as her mental status is stable than life will go on for us fairly smoothly. Thank you for your thoughts, Jackie. "How long is enough and not too much" is a mystery and something we cannot gauge or judge, but I hope at the end of my life to at least try to come to an understanding with myself and with my family and the medical community of what constitutes "the point of diminishing returns." Or as Walter Matheau and Jack Lemmon discuss in the movie "Grumpy Old Men," we would hope that our passing will be quick, painless, and easy. Tom if only most people would have the mercy of going to sleep and never waking up, my experience so far with family friends and even our pets has been of long lingering painful to watch deaths. Not to say being infirm and mentally deficient for years before succumbing is the majority but none of our departed had the quick painless type of passing that Jack Lemmons father did in the movie. Yes, Hollywood has a way of smoothing the bumps out of the journey.